Sometimes it’s the simple things that work. 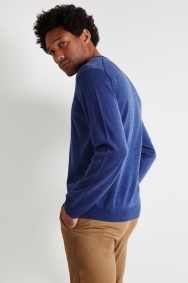 This Moss London jumper is just that: cut in a classic V-neck style in a contemporary blue colour, it’s the ideal addition to any smart-casual wardrobe. 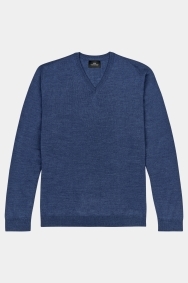 Made in Italy from 50% merino wool, it’s warm, comfortable and a great layer for shirts and jackets. Heading to work? Wear it over a shirt and tailored trousers. 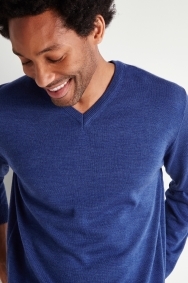 For a more relaxed look, pair it with a white t-shirt and jeans. 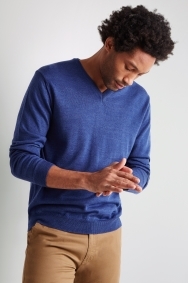 Lovely jumper, good quality, soft to touch, comfortable to wear, my partner loves it.